The lads had a bit of a layoff between recordings, but that won’t effect the end listener. It was – however – a perfect episode for Matthew to come back in on. Matthew has plenty to say about the heavy focus on Starbuck, as well as the focus on the Cylon mythos. 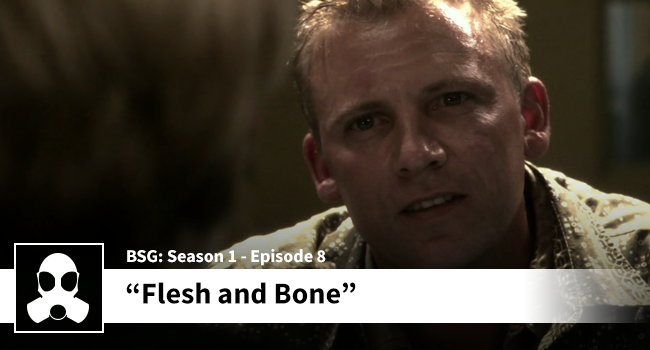 Dean likens himself to Leoben; He is watching truth float past Matthew in the proverbial stream. He leads Matthew along, but is he helping or simply dumping half-baked philosophies into Matthew’s fertile mind? Have a listen and learn about all of the mysteries of “Flesh and Bone”.